Get those fingers tapping - entries for the NT Literary Awards are open until the end of April. The annual competition is a great excuse to knuckle down and get words on paper. Last year’s Short Story winner Mhairi Duncan spoke with Off The Leash about the benefits of a call to action, and her writing process. 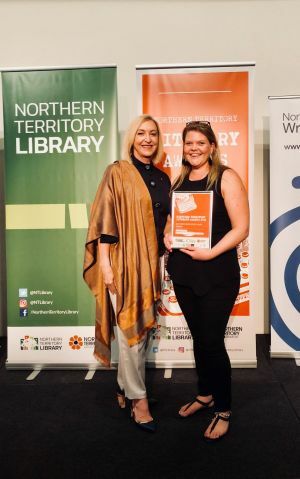 How did the NT Literary Awards motivate you? A writer friend of mine told me about the awards and I saw the deadline and said to myself ‘you’ve got to sit down and polish this up’. I didn’t enter thinking I’d win, it was more a good deadline that forced me to sit down and enjoy my writing. What’s your writing routine or process? I brainstorm and have bullet points for a structure and I just do a lot of free writing without any judgment - I just make sure I sit down for a particular length of time and write, write, write. It’s usually first thing in the morning or last thing at night, that’s when my mind is the most active or clearest. It’s after that when it becomes quite tricky, when you’ve got to really become quite focused with your editing. I have to read things out loud to myself, so I squirrel myself away and I go through paragraphs to make sure it flows for me lyrically out loud. Why is it so important to sound good out loud for you? I had two lecturers at university in Scotland, Alan Spence and Wayne Price, and they were very much about how your writing sounds. When you’re a Scottish writer I think you’re very in tune with how your dialect sounds. So it doesn’t have to be grammatically right, it’s got to sing off the page, in a way. That’s something I had drilled in to me at uni. When you’re not writing you’re a schoolteacher - is the NT Literary Awards something you’d encour-age young people to enter? There are some cracking young writers in Darwin - it’s a really good opportunity for them. I’ll definitely be reaching out to students and teachers and reminding them it’s open and they should throw their hat in the ring.